There are two big, and pretty obvious, changes to the website. First up is the new banner, complete with an extra tagline (Sizzling SciFi & Epic Fantasy). This is a big improvement on what used to be available to subscribers. 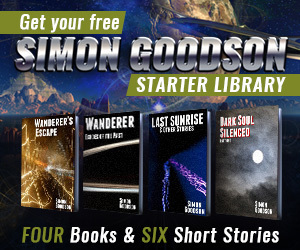 Three of the books are already permafree at a number of locations, but this is the only place to get Wanderer – Echoes of the Past (2nd book in the Wanderer’s Odyssey series) free. For the six short stories you can now get all of them in Mobi (Kindle), ePub (Apple, Nook, Kobo etc) and PDF (read it on your PC / phone with Adobe) formats. I’ve sent out details to all existing subscribers already, if you’re a subscriber and you haven’t received the mail for some reason then please check your spam folder then get in touch with me via the Contact menu item above if you still can’t find it. Please spread the word too – as an Indie author the most powerful marketing tool is word of mouth from people that loved my stories. Thanks!